“March Madness” got its name for a reason. For both men’s and women’s college basketball, the tournament season is unpredictable. Success requires not just elite talent and excellent coaching but enviable consistency. One bad game or one strong performance from an opposing player, and the ride comes to an abrupt end. 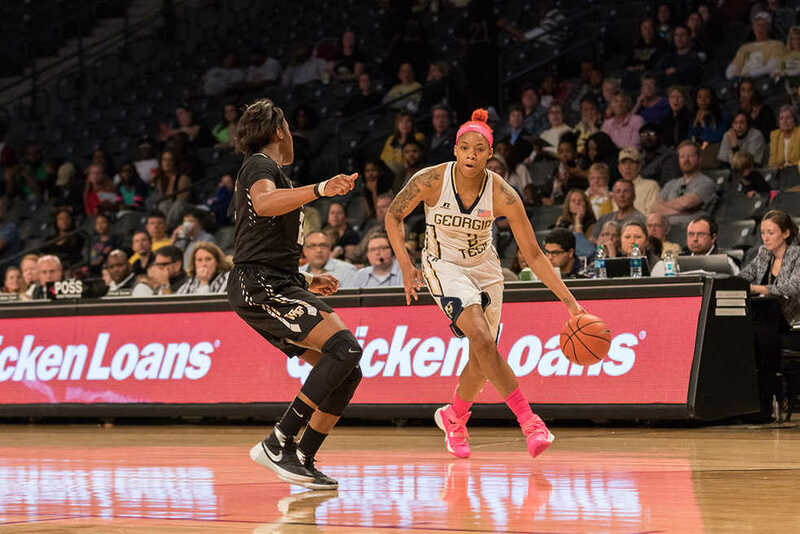 For the Tech women’s basketball team, then, their final contest of the regular season, a 66-62 victory over conference opponent Wake Forest on the team’s Senior Day provides a fond memory players can look back on regardless of how the month ahead shakes out. guard/forward Irene Gari. As they have so often, both Whiteside and Rogers put up impressive statistical performances and were instrumental in the winning effort. Whiteside scored 19 points in 37 minutes on the floor. While she was less efficient than desirable, missing 9 of her 15 attempts, she augmented a mediocre outing from the field with a strong 5-6 mark from the free-throw line. Fellow senior and Charlotte, N.C., native Roddreka Rogers had an equally impressive farewell regular season game. Rogers collected eight points and nine rebounds, a few plays away from notching a double-double. She was an impressive 4-for-8 from the floor that night, converting her opportunities consistently. It was a fitting goodbye for a player who has worked her way into the hearts of Tech fans with her combination of hard-nosed play on the glass and dogged defense. She is second in school annals with a .570 field goal percentage, not to mention top-ten career figures when it comes to rebounds and double-doubles in a single season along with blocks in a single season. The Jackets face Wake Forest in the second round of the ACC Tournament Thursday at 6 p.m. The ride is nearly over.